This cake is sort of an ode to one of my best friends. 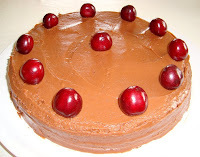 My friend gave me a chocolate cake with cherry filling and a chocolate ganache toping for my birthday a few years ago. God it was so good! 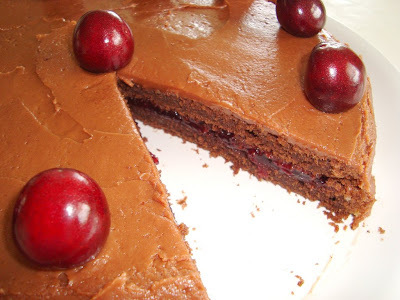 Cherries and chocolate go so well together. Which is why I tried out this sinfully good combination. It is almost a black forest cake but it misses whipped cream, which is a key ingredient in black forest cakes. Whipped cream or not, it’s still one delicious cake! - Pour the batter into 2 8-inch (I used 2 9-inch) pans buttered or lined with parchment or wax paper and bake for 30 minutes (mine needed 25 minutes). 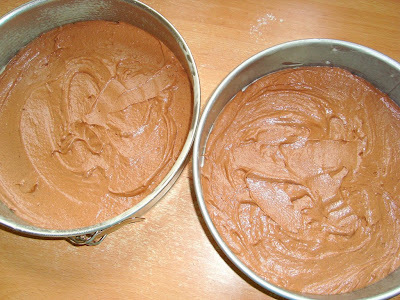 When they’re ready the cakes should be starting to shrink back from the edges of the tins. Leave for 10 minutes in their pans on racks, then turn out to cool. 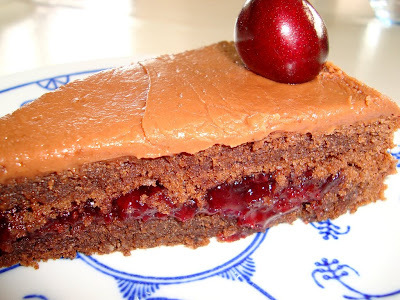 Spread the cherry jam between the cakes. This chocolate batter isn’t the best ‘lick out of a bowl’ batter, but believe me, it makes up for it when it is baked. 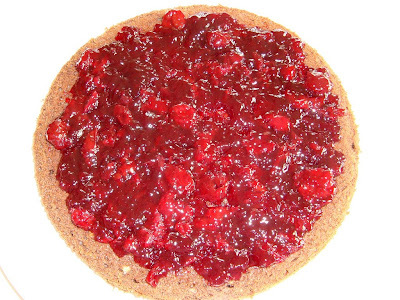 The cherry jam filling. Scrumptious! You can hardly see the cherry jam. It’s kind of a surprise! Wow the cake looks super moist! Yum! I don't think I've ever had cherry jam before! It looks delicious! I love how the jam oozes out, and it looks so moist! Look at that cherry jam! Love it!